This ASCD Study Guide is designed to enhance your understanding and application of How to Teach So Students Remember, 2nd Edition, an ASCD book written by Marilee Sprenger and published in February 2018. Many of the questions contained in this study guide are ones you can think about on your own or in a small group, but you might consider facilitating a larger group with others who have read (or are reading) How to Teach So Students Remember, 2nd Edition. It is suggested in the Introduction that each of us follows the same process when learning and mastering something new. Review these stages and identify something you learned in this way. Share your experience with your colleagues. Some updates and changes to the book are listed. Which of these do you find most intriguing? Can you see where applying this information will benefit your students? Discuss the attention and motivation strategies that you use. What works best for your grade level or content area? Using emotion in the classroom may be more difficult in some content areas. Where would it be the easiest? Brainstorm ideas for adding emotion in your content area(s). As educators we are all familiar with Maslow's hierarchy of needs. How do you feel about Matthew Lieberman's thoughts about a hierarchy with social needs represented first instead of physical needs? How would you adapt this idea to your classroom? There is a strong research base for using advance organizers. Share examples of these with your colleagues. Create an agree/disagree chart for this chapter. Consider the common ground you have with your students. Brainstorm areas that could be used to reach students in relation to your content area. In your own words, explain to a colleague the importance of Step 1. We are often asked to reflect at the end of a lesson or unit. This is important, however, the reflection step in this chapter comes after the introduction of a lesson or concept. Do you currently give your students this opportunity to make connections with prior knowledge? Can you see a difference in the retention of information when you allow your students to reflect? What habits of reflection do you incorporate into your teaching? Questioning is one way to get students to think about their thinking. Make a list of essential questions for this chapter. There are several types of wait time mentioned in this chapter. Which do you use? Model for your students how you reflect as you read. Choose a difficult selection and read and reflect aloud as you encounter difficulty with meaning or as you are making connections. In your own words, write the important concepts in this chapter. Recode the concepts in this chapter as though you are explaining the concepts to a colleague. Writing helps information "stick." How would you explain this to students? Examine the seven cognitive processes described in this chapter. How do you use these in your classroom? How could you use them more? Pair up and write on sticky notes each idea that comes to mind when you think of the word "memory." Put the ideas in categories and create titles for each category. Stick these on chart paper, and compare categories and ideas. Discuss how you might adapt this activity for your classroom. Ask your students to draw pictures of the concepts that you are studying. Then have them write about the concepts. Determine if recoding in writing was easier after drawing. Compare results with your colleagues. How do your students respond to your feedback? Does the feedback change the way they are learning? Assessment is feedback. Think about the difference between formative and summative assessment. Then look at your assessment techniques. Do you have a balance between the two? More formative assessment provides you with what kind of information? Create a graphic organizer for the three types of feedback. Alone or with colleagues, fill in examples of motivational feedback, informational feedback, and developmental feedback that you use. Which do you use the most? Is there one type that you do not have in your repertoire? How could you add it to your current practice? What are you learning from an episode of feedback? Feedback is like a dance in which you lead your partner (the student). If you are leading well, your partner follows. If not, you must change your technique. Review the memory processes involved in reinforcement. Discuss how rehearsals can take students from lower levels of thinking to higher levels of thinking. On page 109, there is a list of ideas for cross-curricular teaching. The author suggests that, "Activities such as the ones above should be preceded by reflection time and followed by reflection and reinforcement after they are completed." Think about this practice. Do you agree with it? Do you use it? Write about a time that you "stepped back and then stepped forward" in this way. Choose a concept that you will soon be teaching. Examine Figure 5.2. Create rehearsals that will place information in the various memory pathways. Field trips create episodic memories if they are meaningful. Establish characteristics of a field trip that will make it memorable. Plan the field trip using the five memory "lanes." Students need to know that sleep affects memory. Discuss with your students their sleep habits and have each keep a chart representing the amount of sleep they get each night. Which mnemonic devices do you use? Try the peg system activity with your students, which will show them how powerful their memories can be. In your content area, find a way to use the peg system to encourage further use. Consider your own practices in using rehearsal strategies. Do you vary your rehearsals to keep students engaged and to reach different learners? Discuss these with your colleagues and share ideas. Instead of saying, "We are going to have a pop quiz today!" try something like, "Let's have a retrieval practice!" That may be less threatening to your students. Practice testing raises test scores. See if this strategy works with your students. How often do you review? Set up several reviews in your lesson plans for a unit. See if these added reviews make a difference. Examine the review practices for your summative assessments. Determine if they support permanent memory, if you need to add more reviews, and if increasing your reviews affects student memory and achievement. How can you orchestrate your reviews to encourage transfer? With colleagues, set up a review for this chapter. Have you found that students rely on their surroundings (episodic memory) for memory triggers? Notice which areas (you, the whiteboard, bulletin board, etc.) provide more cues. How can you use this information for your lessons? How much test anxiety do your students experience? How do you help students through this? Talk with colleagues and share strategies. If you begin with the end in mind, your assessment is created before your lesson plans. Therefore, your instructional strategies should match your assessment. Bring in assessments and unit plans to evaluate how closely aligned they are. Vocabulary is coming to the forefront with its effects on student achievement. Susan did not match her test vocabulary to the vocabulary she used instructionally. Discuss why the vocabulary during rehearsal and review must also be used on the assessment. Examine your summative assessment strategies. Which type of assessment do you use more, recognition or recall? Do you have a balance? Compare each student's success on the various assessments. Could you help a student by increasing the number of this type of assessment? The suggestion of a blank sheet of paper at the end of a test for students to write down what they know is intriguing to the author. Try this strategy and see if you discover more information about how your students learn and remember. The seven steps all begin with R. Can you name them? Did this mnemonic device help you? Now take the seven steps and see if you are able to identify the forms of memory used for each step. Many teachers use these steps in creating daily lesson plans. Suppose that you have been asked to present information on memory to the parents of your students, perhaps at a PTO meeting. Decide what would be valuable and helpful for parents to know. Create an outline using the seven steps for your presentation. Discuss with your colleagues the type of professional development you have had to increase student learning and memory. What are next steps for you and professional learning? Review the lobes of the brain and their functions. Draw your own diagram. Discuss the difference between explicit and implicit memory. Survival, novelty, and choice are suggested as reasons for remembering. How do these fit into your classroom strategies? How do you approach these areas in order to help your students remember? Consider the graphic organizers in this appendix. As a group, classify these organizers according to how you could use them in the context of your content. Share other organizers that you have found useful. Organizers lose their novelty if they are overused. Add these new organizers to the list you created in question one. If you teach at a low-performing school, you may want to choose a few organizers that will be used at all levels. This continuity will help students remember how they are used and what information they call for. 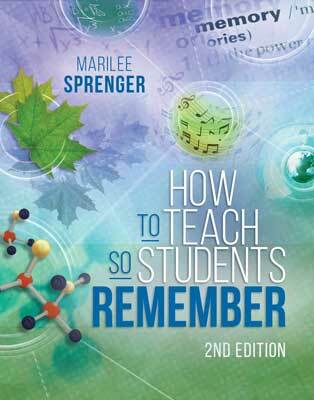 How to Teach So Students Remember, 2nd Edition, was written by Marilee Sprenger. This 216-page, 7" × 9" book (Stock #118016; ISBN-13: 978-1-4166-2531-5) is available from ASCD for $23.96 (ASCD member) or $29.95 (nonmember). Copyright © 2018 by ASCD. To order a copy, call ASCD at 1-800-933-2723 (in Virginia 1-703-578-9600). Or buy the book from ASCD's Online Store.